A fortnight ago on Newsnight, some neanderthal union leader assured us that within 3 weeks the fuel depots of Britain would be blockaded until the government cut fuel duty. So we await next week with trepidation. If he does indeed scrap the April hike, it has a significance even greater than the £500 million tax revenues foregone thereby. Because the underlying reason for the series of fuel duty increases is "Green Taxation" - making energy consumption ever more expensive, to force us into efficiency measures. But as such measures go, one penny on petrol pales into insignificance compared to what Huhne has planned for our electricity bills. He intends the 'decarbonisation' of the UK by 2050, for which purpose (a) most transport and space-heating must switch from oil and gas respectively, to electricity; and (b) said electricity must not emit CO2, i.e. it must be renewables and/or fossil-fueled with carbon-capture. To called this far-fetched would be very restrained. However, there's not a moment to lose and Huhne proposes to start by 'reforming' the electricity market with a slew of complicated interventions, all of which will result in increased electricity prices - and by a great deal more than £500 million p.a., as £200 billions are required for the madcap schemes he has in mind. Now that's real Green Taxation. 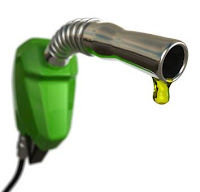 If, in the face of our Newsnight neanderthal and a bit of bad news on the GDP and inflationary front, Osborne shows immediate signs of backing down on fuel duty - what prospects for Huhne's plans ? Electricity bills - involving grannies and hypothermia - are every bit as emotive as petrol. Let's see if Huhne can - or even tries to - defend Green Taxation at the petrol pumps. It has long been my view that when push comes to shove, GDP trumps GHG. There are more votes for granny too, than there are for decarbonisation. We should consider ourselves lucky that Huhne only intends to mug us for £200 billion because the real Green Carbon zealots want to kill us all. See hauntingthelibrary. Surely if he wants us to switch our heating from gas to electricity the price of electricity needs to come down rather than go up? Aren't we going to need a few more generating plants before we can replace gas and oil with electricity? Huhne was good on #BBCQT, can't he be shuffled off to a department where he can do some use? budgie - yes, when contemplating arguing with a Green the ranging-shot should always be: are you content to live in a cave ? Seems it is a case of history repeating itself, could the deputy prime minister end up with an egg being thrown at him if and when he goes on a walkabout in south Wales, just like Prezza did. brilliant article Nick. One of the best we have done here.